TOPIC: Every gun carrier has this problem. We all have to visit the stall on occasion and use a public bathroom more often than any of us would like. Every concealed carrier remembers the first time they went to drop the pants and stopped and thought… what do I do with the gun. Today we hash out the various considerations and strategies for the most boring and normal of daily activities… the restroom break. Today’s episode is sponsored by the Brave Response Holster – are you looking for the most versatile, most comfortable, most concealable holster on the market? Look no further than the Brave Response Holster – compatible with nearly any semi-automatic handgun and many types of revolvers, and it doesn’t matter what you wear for pants…or even if you wear any pants at all! Fits all waists from 20 to 54 inches. 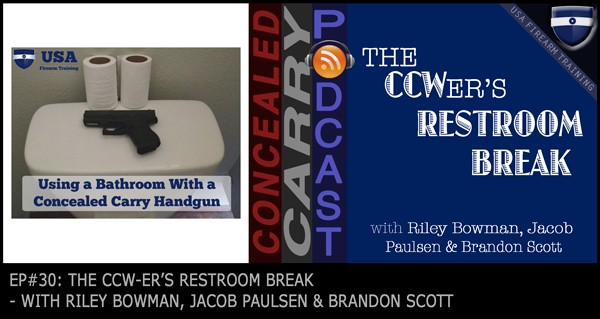 Check it out at concealedcarry.com/braveresponse and listen to this episode for a special coupon code. See You at American Marksman Nationals!